Chris Broderick: All That Shreds Magazines Guitarist Of The Year 2017 - Welcome To All That Shreds Magazine! The heavy metal music industry has produced top class guitarists that are the real motivation and inspiration for many heavy metal fans. Many guitarists liked to be typical guitarists, and they wanted to be guitarists only. They decided to enjoy the advantage of being guitarists only. They just wanted to play and did not like to take the responsibility of writing songs or what should be recorded. But at the end, they were only guitarists, and you might not even know many of them. But when we talk about heart winning guitarists who produced their name in the whole heavy metal music world, you will see Chris Broderick at the top. Be that as it may, for ex-Megadeth guitarist Chris Broderick, shaking out to another person’s tunes after a long time wasn’t sufficient. So on November 25, six hours after drummer Shawn Drover left the band, Broderick disclosed to Dave Mustaine he, too, was quitting. After leaving Megadeth, Chris Broderick and former Megadeth drummer Shawn Drover formed Act of Defiance along with ex-Scar the Martyr frontman Henry Derek Bonner and former Shadows Fall guitarist Matt Bachand. The decision was tough, and this band was a significant part of his career, but the thirst for real freedom in presenting himself compelled him to make this life-changing decision. You cannot win any award with luck or some shortcut, it takes a lot of dedication and motivation to produce your name in any industry, and Chris Broderick knew this, and he earned this. He was born with remarkable skills, and he started playing guitar at the age of eleven. Eleven years old is the age when typical boys have toys in their hands, but Chris Broderick had a guitar, and that guitar proved to be life for him. He is not a typical guitarist with some tunes, but he is a guitar industry by himself. His playing styles range from metal, classical, neoclassical, and jazz. A Diamond comes to the market after a lot of struggle and hard work, but Chris Broderick is a self-made diamond. He had commitment and motivation that is required for such great goal and to win this award.it is said that he used to practice and play guitar for up to 14 hours a day. Believe me; it is not easy for a teenage boy not even for a grown man. But he did it and therefore today, he is the real name for Guitarist of the Year 2017. He practiced electric guitar, classical guitar, piano, and violin under a strict daily routine that polished his talent and brought the real guitarist out. He has said that at that time it seemed more like a “chore” than for entertainment. There might be many great names too, but when we look for the all in one talent, we cannot find any other fit rather than Chris Broderick. His forever green performances and his devotion to the metal world is the reason behind his selection for All That Shreds Magazines Guitarist of the Year for 2017! 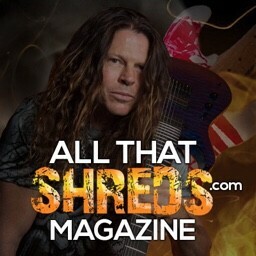 Congratulations Chris from all of us here at All That Shreds Magazine!